Charming ladies and rather dashing chaps, are you all ready to enjoy a devilish globe-trotting crime caper with a dash of moustachery? 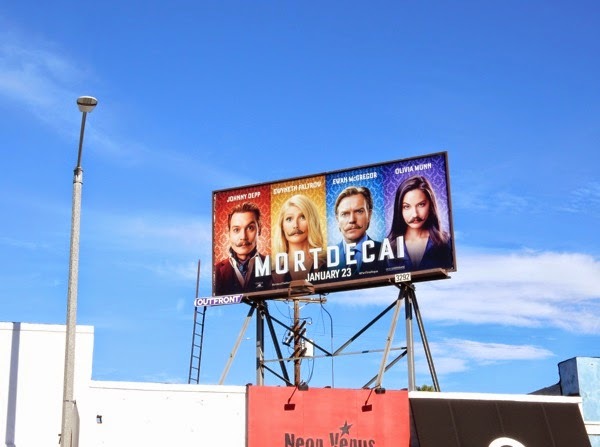 Playing to his strengths of portraying eccentric characters, Johnny Depp returns to the big screen as 'Lord Charlie Mortdecai', art dealer extraordinaire and part-time scoundrel. 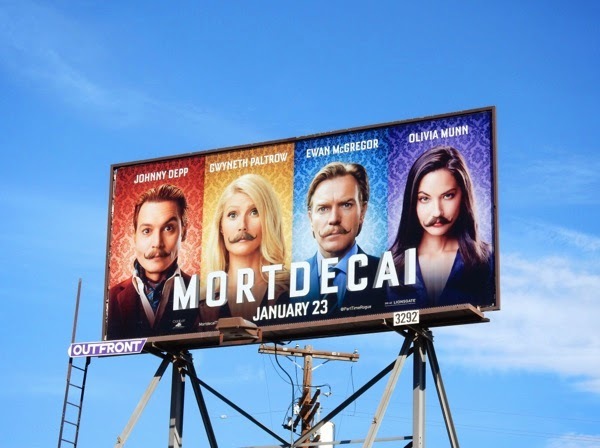 Based on the British series of 70's comic thrillers by Kyril Bonfiglioli, Mortdecai is tasked by Ewan McGregor's MI5 inspector to track down a stolen painting, with the aid of his manservant 'Jock Strapp' (played by Paul Bettany), that supposedly holds the key to a lost bank account filled with Nazi gold. 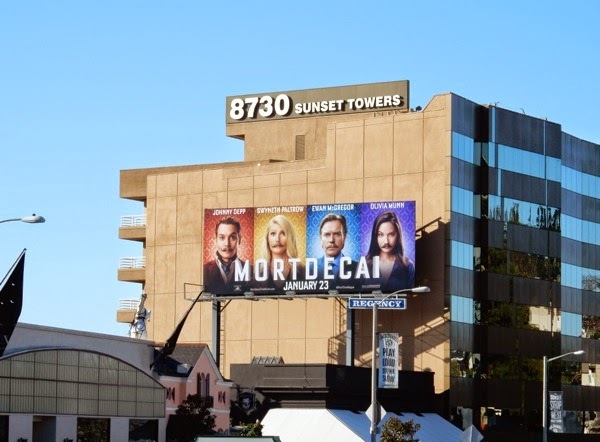 Gwyneth Paltrow plays the aristocratic rogue's beautiful wife and Olivia Munn, the spoiled seductress with a fondness for facial hair, also out to get her hands on the special painting. 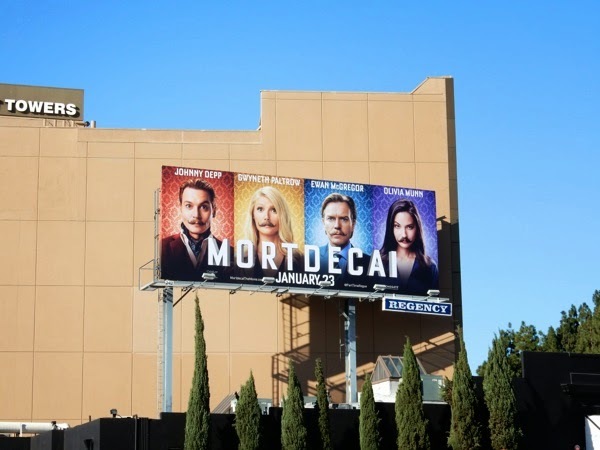 These fun moustachioed cast billboards for Mortdecai were snapped along Sunset Plaza on December 31, 2014 and smaller version along Melrose Avenue on January 7, 2015. 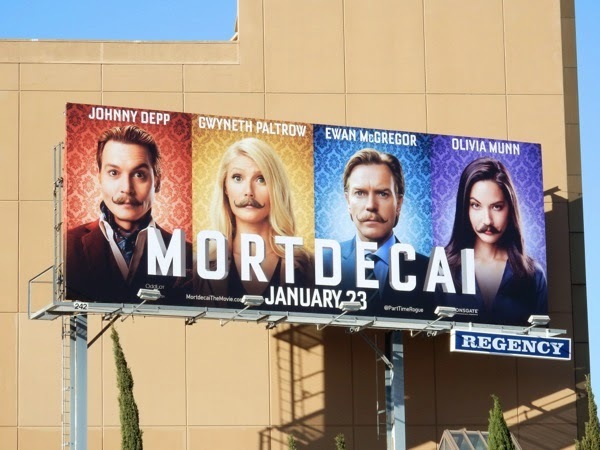 Let's hope this dapper espionage comedy fares better than Johnny Depp's last few films, as The Lone Ranger and Transcendence were far from great movies.